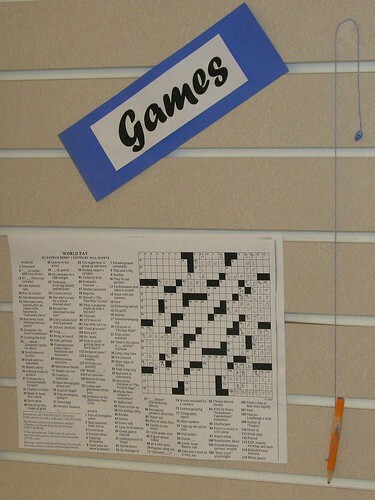 Alex Byrne, Youth Services librarian at the University Place Library (WA), decided to tape a crossword puzzle and a pencil to the wall. Anyone is welcome to add a word if they know one, turning this into a social crossword puzzle. How simple! He plans to add a magnetic chessboard to the wall, too. Teens might enjoy the novelty of playing chess on the wall. Not all collaboration has to be online, but offering fun ways to participate at the library — that’s cool! This entry was posted on Wednesday, December 5th, 2007 at 3:52 pm and is filed under fun. You can follow any responses to this entry through the RSS 2.0 feed. You can leave a response, or trackback from your own site. This is so awesomely simple, I feel like dancin’ the chicken. Ah, but doing it by yourself is no fun. You must get your co-workers to dance the chicken with you. After all, dancing is an inherently social activity. Oh I love this idea. We put jigsaw puzzles out, but I never thought of the crossword puzzle. Very clever.